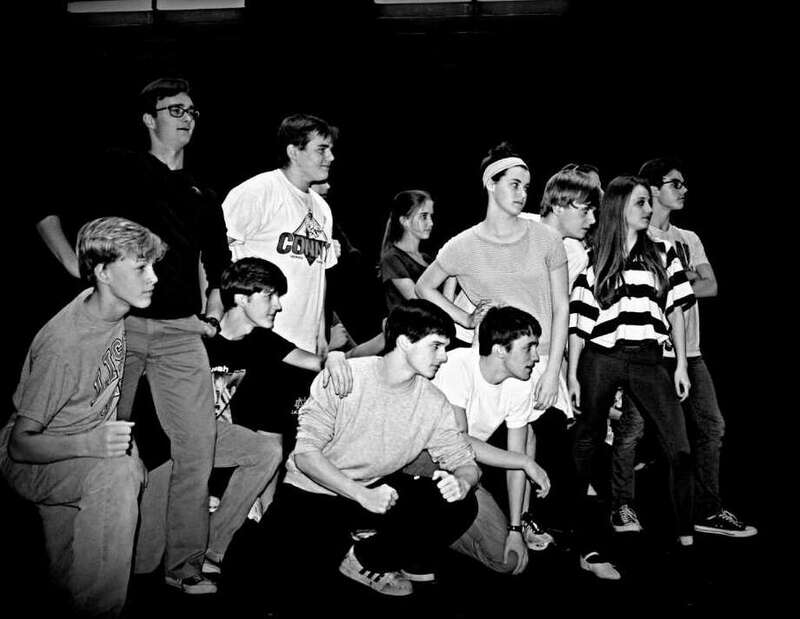 Darien High Schoolís spring production of "West Side Story" will premiere next week. Pictured are the "Jets." Darien High School's spring production of "West Side Story" will be directed by Ms. Nancy Herman, Theatre 308's long-standing faculty advisor. Herman directed West Side Story in 1992; and though Staples High School produced its own production in the fall and Brien McMahon High School will be opening this spring as well, this did not stop. Herman from directing it for a second time. When asked to describe his character, the leading male, Tony, senior Kevin Koenitzer gave his opinion. "He's a combination of teenage angst and excitement -- a very interesting but very volatile character," he said. However, this description could be applicable to any one of Bernstein's characters who were inspired by Shakespeare's characters within the timeless tragedy of Romeo and Juliet. In "West Side Story," it is racism not a family feud that separates the lovers; but in keeping with Shakespeare, Bernstein epitomizes the eternal nature of lovethrough a series of brash, brutal events that last over the course of a mere couple of days. Prior to auditions, Theatre 308 decided to hold workshops so that students could learn the dance portion of the audition and be introduced to the musical's score before the actual audition process. "We knew that for this show we were going to have to try and encourage new people -- particularly boys -- to audition, and we thought workshops would make auditions less intimidating and allow people to know [so that people knew] what to expect," Herman said. "More than half of the guys that are in the show have had no prior vocal or performing experience, and I'll be a little subjective and say that I'm really impressed with all of them," senior Addison Thalhamer said, who will be playing the part of Riff, leader of the Jets. Senior boy participants, such as Mike Stovall, Kincade Webster, Charlie Baird, Cal Kevorkian, and Grayson Horan, are juggling baseball, track, Post 53, and hockey commitments on top of the show. Since this is the last year that these boys can participate in 308, they were all willing to make time for the show because they wanted to be part of the selective cast. According to Herman, "West Side Story" -- a show with a strong message -- has a small cast. More than 80 students tried out for the musical this year, but only 37 were chosen; out of the 37 cast members, only 17 are female. "Unfortunately, the script doesn't give us the opportunity to have a big chorus, but it does mean that we have a top notch cast," Herman said. "I feel as though our potential for this show far surpasses that of the shows that 308 has done in the past," senior Nicole Gutierrez said, who will play the part of Maria, the modern, Hispanic counterpart of Shakespeare's Juliet. West Side Story has been a huge undertaking for Theatre 308 due to its intense and demanding choreography. Katie Mulcahey, professional commercial dancer, and math teacher Lauren DiStefano will choreograph the musical. "I am thrilled to be working with such a great group of kids. They're eager to learn and experience a new aspect of performing," Mulcahey said. All dance moves are modified steps from the original Broadway production (1956) as well as the screen production (1961), so the first month of rehearsals was dedicated to dance alone. "We truly hit the ground running with this show and have tried to tackle as many dance numbers as possible before even blocking the more acting-oriented scenes," Thalhamer said. Though it is racial tensions that drive the plotline of this show, according to senior Hannah Caldwell, who will be playing the part of Anita, "this show is centered on the loss of innocence." This thematic element is indeed highlighted by the inclusion of faculty members in the show. Herman cast teachers at Darien High School to play the parts of the adult characters in the show in order to highlight the naivety of the two gangs and their violent ambitions to rule the streets. History teacher Mr. Bruce Clarke will play Doc; Gabriel Morrow, special education teacher and the director of Theatre 308's fall drama, "Dracula," will play Shrank; will Darien High School's Varsity Basketball Coach and special education aide Kyle Marian will play Officer Krupke; and Dennis Cummings, history teacher, will play Gladhand. The technicality of the show must also be noted as the production crew of this musical has had to build from scratch a set composed of New York scaffolding in order to create the sense of the city. "The set is large scale and very vertical," Senior Juli Flynn, one of the head designers of the set, said. "It is more technical than most productions because the pieces stand separate from one another on stage. Each architectural component of the set takes on a free-standing, independent presence." Though more than 30 kids have participated in building the sets, only 16 will be needed on running crew, as most of the set remains static for the duration of the show. Senior Kristina Lew will return as stage manager for this production after managing the fall drama, and she will be assisted by sophomore Caroline Wetterauw. Senior Amanda Hutter is acting as dramaturg and assistant to the director. "As challenging a showas it is, it has been an easier production run because everyone is on top of their stuff," Musical Director Christopher Andrade said. Herman applauded the adult creative team. "We have a fantastic cast and crew, but thisshow has moved along without a hitch due to our adult creative team--from the music tothe set design to the choreography collaboration." Tickets can be purchased online for the March 22, 23 and 24, 8 p.m. shows at www.seatyourself.biz/theatre308.